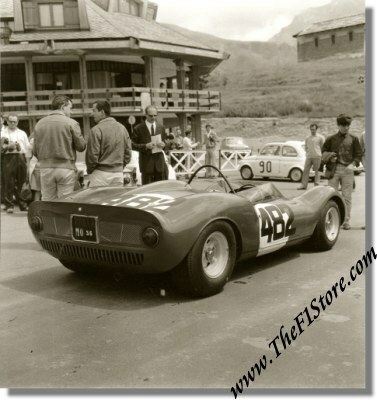 1965 photo of Ferrari 206 P Barchetta S/N 0834 Cesana-Sestrieres Hillclimb. This is a more recent print (exact age unknown) of the Ferrari Dino 206 P of Ludovico Scarfiotti prior to the Cesana - Sestrieres hillclimb on July 25, 1965. Scarfiotti would win this race outright. The car, S/N 0834, was modified from Dino 166P earlier in July 1965 and the body was modified from Berlinetta to completely roofless Barchetta just prior to this race. It survives to this day in the UK. The photo is in mint condition, measures approximately 20 x 20 cm or 8 x 8 inches and carries no references to the possible photographer.